Choosing an appropriate surface for suction pads is necessary if you want your indoor or outdoor thermometer to stay in place. As for any suction pad, the surface must be perfectly smooth: mirrors, windows, smooth tiling are the most reliable surfaces. Lacquered surfaces (wood, metal) can do the job, depending on the type of lacquer. This thermometer can give you the indoor or outdoor temperature, and remains legible without opening the window. Theoretically, one places a thermometer on the north side of the house: an exposure to sunlight is likely to disrupt the measurement. also beware of blinds, shutters and other window equipment: ensure before you install your thermometer you will not crush it when pulling the blinds down. 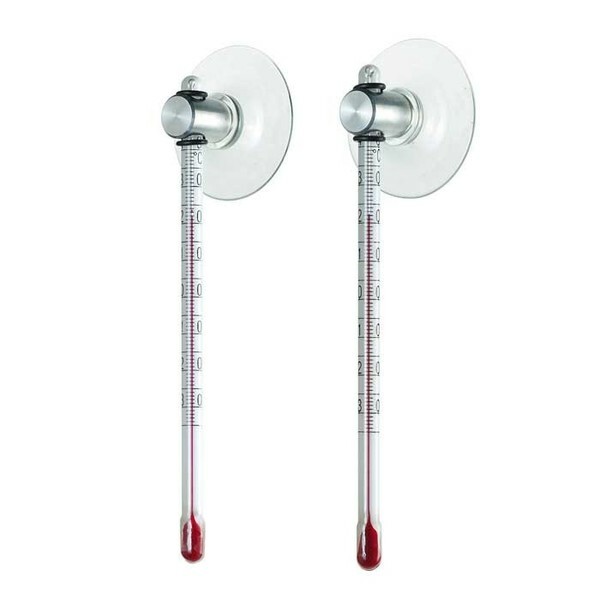 This thermometer is made by Fairwerk, a company resembling the French CATs (Centre d'Aide par le Travail) in the beautiful high Bavarian village of Wasserburg am Inn (Germany). Fairwerk employs more than 300 disabled people under the explicit catch phrase: nice things made by disabled people. Thanks to methods of breaking down of the manufacturing process tasks, the company offers more and more complex products, whilst always respecting the same quality standards. simple: easy to install, easy to place elsewhere, indoor or outdoor temperature, this is total sobriety with no concession on functionality. excellent value for money: 10€!